Santa Barbara County mock trial co-champions and arch rivals San Marcos andDos Pueblos high schools were all smiles on Sunday as both teams capped their outstanding seasons by winning medals at the California Mock Trial Championships in Riverside. The tournament brought together 32 county champions for the three-day competition. La Reina High School from Ventura County was crowned the champion and will represent California in the national championships. In an unprecedented showing, Santa Barbara County teams both placed in the top eight in the state, with San Marcos placing fifth and Dos Pueblos placing eighth. Both schools went 3-1 after two days of grueling back-to-back trials. The Royals, with victories over Sonoma, San Francisco and Tulare counties, were a scant three points in one trial short of competing for the championship, while the Chargers, with victories over Los Angeles, Monterey and San Francisco counties, won the eighth-place medal — their second straight top-eight finish in the state tournament. 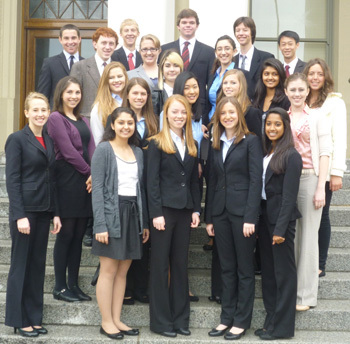 The state finals are the culmination of a long season of work for the mock trial competitors. San Marcos returned to its statewide success in the mock trial competition, earning its fourth fifth-place finish to go along with its state championship titles in 2004 and 2006. In early March, for the first time in history, both teams were named county co-champions after they tied in the championship round. After a tiebreaking trial was held two days later, the Royals earned the lone state championship slot. Last Wednesday, however, the Chargers learned that they had secured a wild card slot at the tournament, but the short notice left the team with only two days to prepare. Still, Dos Pueblos co-captain and lead prosecuting attorney Jeff Campbell was elated to learn that his team was headed to Riverside. Having two county teams finish in the top eight at the state finals is a source of pride for Dos Pueblos co-captain Corinne Ruth.